Blue Bonnet Cafe ~ Marble Falls, Texas - R We There Yet Mom? “It’s What’s Cooking in Marble Falls.” – this sweet slogan is so true. 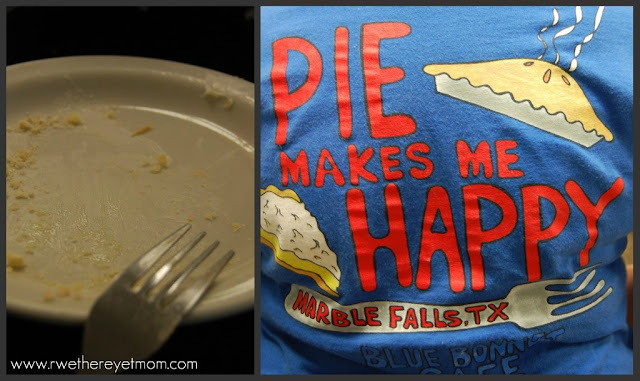 For one of the best home-cooked meals and amazing pie, everyone in the Hill Country knows you head to Blue Bonnet Cafe in Marble Falls, Texas. 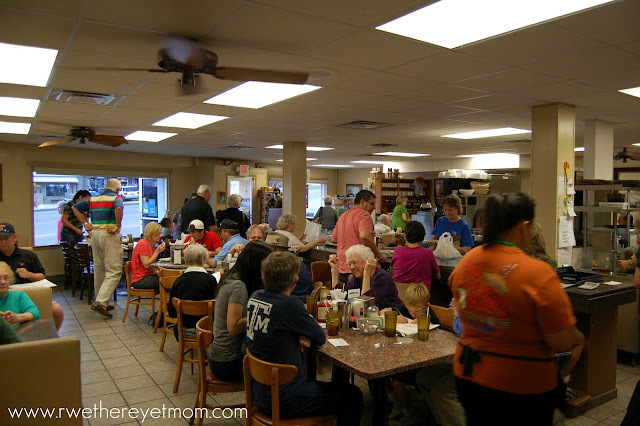 With a cozy, down-home atmosphere, the Blue Bonnet cafe is busy at all times of the day. Could be their yummy pancake breakfasts, big platters of chicken fried steak, or just pie that keeps everyone coming. Yep, I think a LOT of people are there for the pie. Blue Bonnet Cafe offers a Pie Happy Hour! (Monday-Friday 3-5 pm) The menu boasts 14 different pies to choose from and you an get that plain, heated up, a la mode with whip cream or ice cream – I tell ya, it is a hard decision. 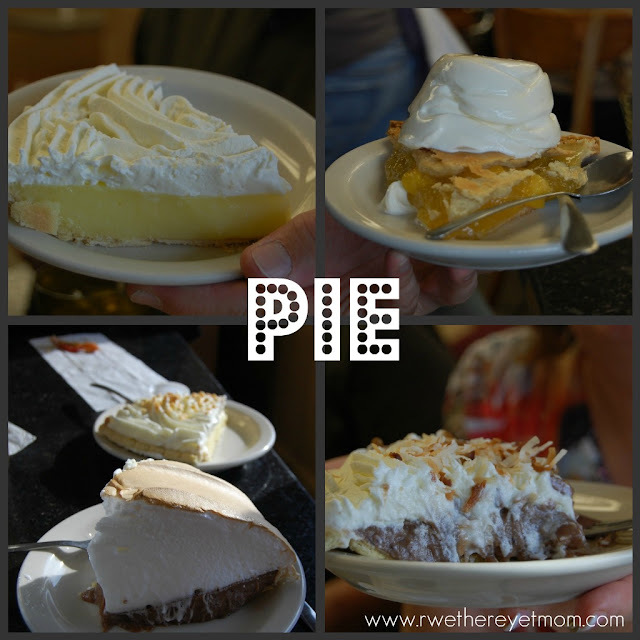 Luckily, when we went over Spring Break, all 5 of us ordered a different slice, so we could sample – Lemon Cream, Apple A La Mode, Peanut Butter, Chocolate Meringue, and German Chocolate – all for one table. Just look at how tall that meringue stands! We did order dinner – the plates are big, so bring an appetite or save room for pie – so despite that, we had no trouble clearing off our pie plates. 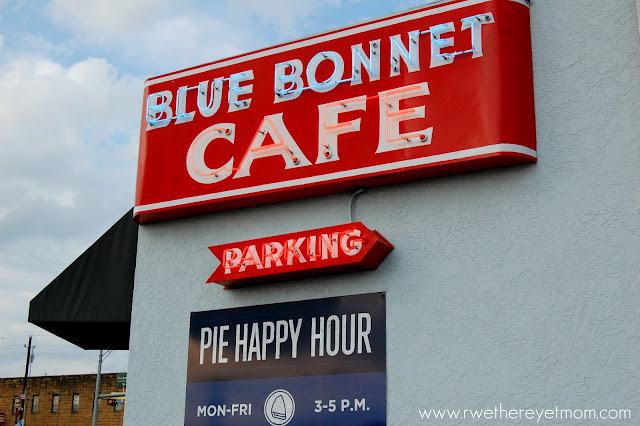 The Blue Bonnet Cafe is the perfect place to stop and get a bite (and a slice of pie!!) after you visit the Longhorn Cavern State Park or take a trip on the Vanishing Texas River Cruise. Maybe you worked up an appetite climbing Enchanted Rock or picking strawberries at Sweet Berry Farm? 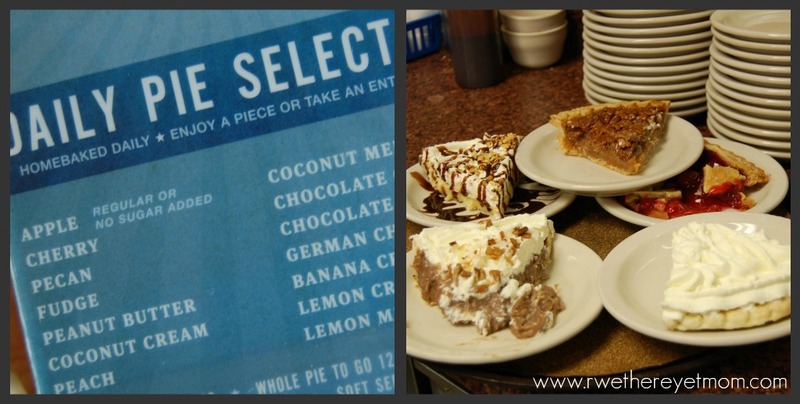 Maybe you don’t need any other reason to go there….except for a piece of exceptional pie. What do you mean “We had dinner”? Pie IS dinner, especially when there’s 12 different ones to choose from. I’m gonna go see if my wife has one hidden in the kitchen somewhere right now. Pie makes me happy too! Love that shirt and would love to try some slices! Um…a pie happy hour? Yes, please. I don’t even really like pie (I know, I know…so strange! ).